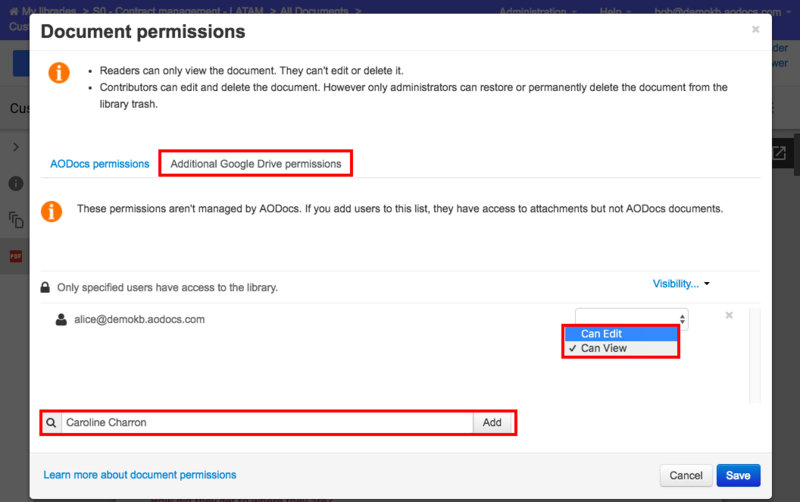 A Secured Folder is the type of library in AODocs which gives you the greatest control over file permissions while still being able to access files from the Google Drive interface. This article explains how to share a folder or a document in Secured Folders. The configuration and sharing methods are more complex than in Team Folders but provide greater control. Files and folders in Secured Folders can't be shared directly from Google Drive. 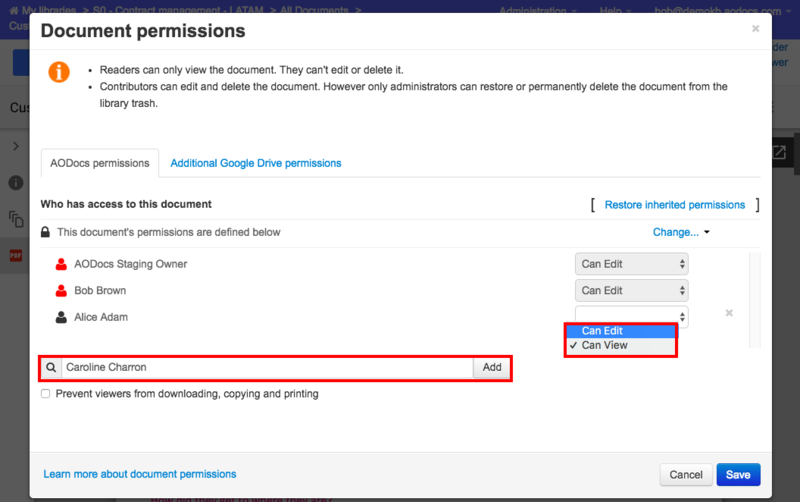 When you try to share a file in a Secured Folder using the Google Drive share icon, you can only request access to the file, even if you have the right to share it in AODocs. Use the AODocs interface to share files and folders in Secured Folders. Learn more: Choose your permission mode, Prevent contributors from changing document permissions. 1. In Google Drive right-click the item you want to share and select Open with > AODocs. 2. If you selected a file, it opens on the document page in AODocs. Learn more: Understand the AODocs document interface. If you selected a folder, it opens in a view in AODocs. Learn more: What are views? - You must be allowed to share the file. - The AODocs Smartbar must be installed. Learn more: Install the AODocs Smartbar. 1. 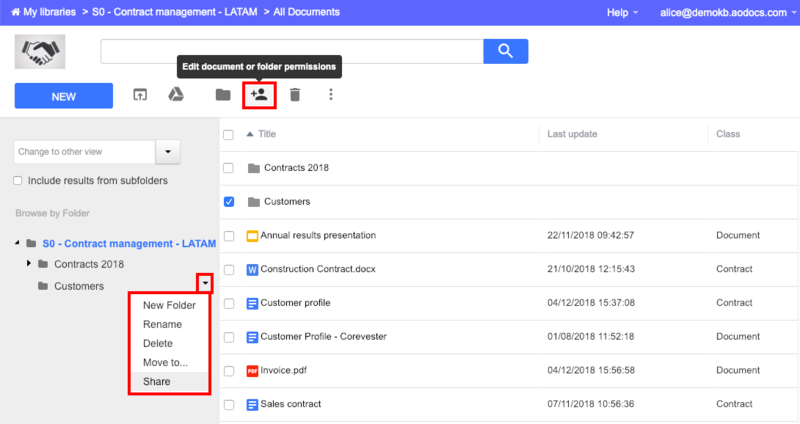 In Google Drive, open a Google file (Docs, Sheets or Slide) stored in a Secured Folder. 2. Once the Smartbar is loaded, press Share in the top right of the screen. 3. You are redirected to the Document permissions pop-up of the AODocs document. You can then follow steps 3 to 6 in the Share a document section. Ensure that the user or group you want to share the folder with has been added to the library root folder security settings. Only library administrators can access the library root folder security settings. Learn more: Secured Folder security center. 1. In AODocs, open a view. 2. Select the folder in the view and press Share. A pop-up opens displaying the permissions for the folder you selected. Note: By default, all the folders inherit the permissions of the library. If the permissions are changed on a folder, the change is applied on all its subfolders and files. 3. To apply specific permissions on the folder, press Change. 4. Select This folder's permissions are defined below. This breaks the permissions inheritance of the library for this particular folder. The permissions are reset and only the library administrators are listed. Tip: To hide a folder in a Secured Folder from all users in the library except the administrators, select This folder's permissions are defined below and save without adding any users. Note: Applying these permissions to the folder and all the files it contains may take some time since it triggers a permission change for every file and subfolder in this folder. Tip: You can delegate the permissions by Google Groups. Ensure that the user or group you want to share the document with has been added to the library root folder security settings. Only library administrators can access the library root folder security settings. Learn more: Secured Folder security center. 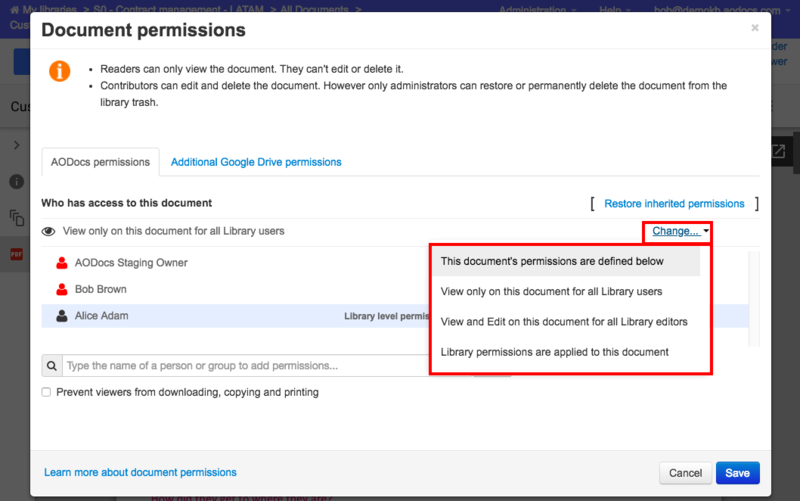 Note: If you don't want to share the whole library with a user, see how to set additional permissions in a document. 1. Open a document in AODocs or select a document in a view. 2. Press the Edit document or folder permissions button. A pop-up opens displaying the permissions for the file you selected. Note: By default, the permissions of all the files in a Secured Folder are inherited from the library and can be customized on a per-file basis. 3. 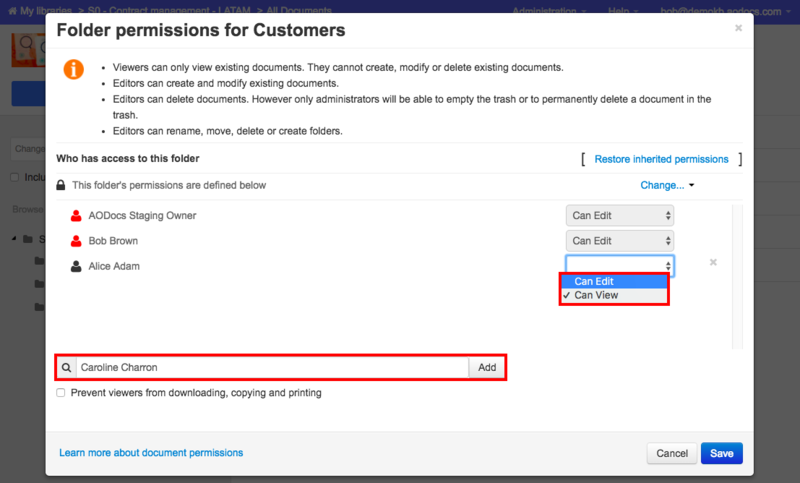 To apply specific permissions on the document, press Change. 4. Select This document's permissions are defined below. This breaks the permissions inheritance of the library for this particular document. The permissions are reset and only the library administrators are listed. Tip: To hide a folder in a Secured Folder from all users in the library except the administrators, select This document's permissions are defined below and save without adding any users. 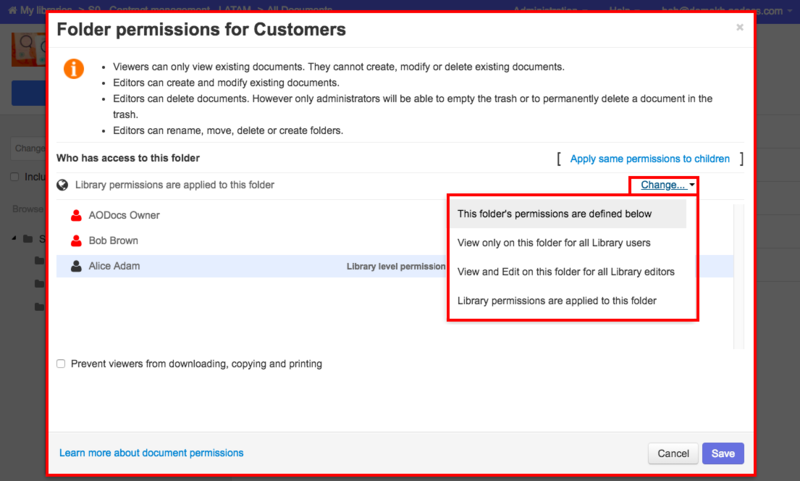 define the permissions in this document for each user or group you added: Can view or Can Edit. Tip: You can delegate the permission management using Google Groups. In Secured Folders, the Document permissions pop-up has a tab Additional Google Drive Permissions. - Additional users don't have to be declared in the library permissions or the whitelisted users. - You can add any Google account to the additional permissions. By accessing the attachment, the user consumes an AODocs license. - Only the attachment is shared using the additional permissions. Additional users can't access the document from the AODocs interface or use the Smartbar features on the attachment. 1. As explained in the section Share a document, open the Document permissions pop-up. 2. Select the tab Additional Google Drive Permissions. 3. Add users or Google groups. 4. Select the permissions level: Can read, Can comment or Can edit. 7. Share the Google Drive URL with the additional users. Sharing a document with additional permissions doesn't share the folder structure or the library. The file will be available in Google Drive under Shared with me. How to get to the sharing settings and get the link to provide??? Then (from the drive interface) click on the sharing button: https://goo.gl/z8zIhr, you should be able to retrieve the link of the file to provide. How do I give external people access to a secured folder if they don't have a Google Account?